Danbury Pavement company. Resurfacing replacing asphalt. Asphalt driveways begin to deteriorate after extensive use and fluctuations in weather. 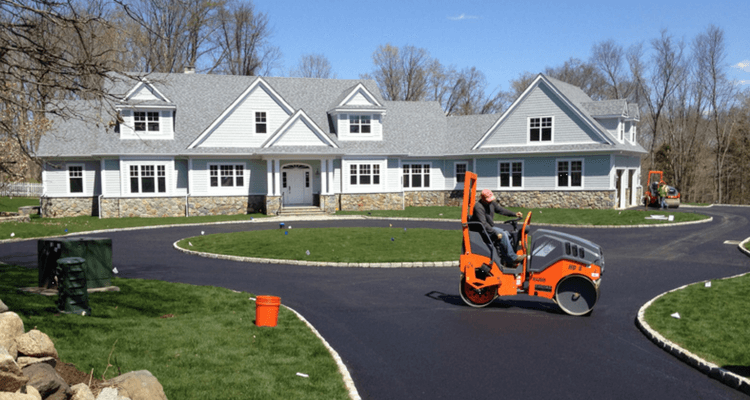 By getting your driveway installed and maintained by a Greenway expert you can avoid cheap fixes and installations that may cost you more in the long run. Several factors need to be taken into consideration before hiring a contractor. Finding the right company for your pavement can save you time and money. The first thing to consider while reviewing contractors is their level of licensure and insurance. Your pavement company should be licensed and fully insured for obvious reasons. Professional contractors will have a license number to allow costumers to rest easy. It’s easy to see which contractors are licensed and which are not, however you should also consider if your pavement specialist is insured. Always ask about the insurance of your contractor before beginning work. If any damage were to take place while the work was being done or if your contractor was injured on the job, it may come down on the home owner. There are tons of companies offering pavement services in the Danbury area. The best way to understand which one is right for you is to do some background research on their previous work. Your driveway shouldn’t be the first project your contractor has worked on. Instead, you want someone experienced taking care of your pavement needs. Most contractors will have testimonials from their previous projects or a work gallery to share with you. Normally, a contractor will feature reviews from previous costumers online as well. You should always consider reviews when hiring a contractor. While reviews will tell you a lot about your potential contractor, it’s important to meet your contractor and discuss estimates towards cost and work schedule. While we all want to save money on our driveway fixes, it’s important to understand our contractor’s estimate. When considering a professional company, you should first establish a time for them to come estimate a quote, most times this estimate is completely free. It normally outlines prices based on asphalt mixture, surface removal, recycling and environmental fees. Once you’ve picked a potential contractor, it’s important to discuss the process of their work with them before making any commitment. Discuss their timeline, quote and what materials they plan to use during their work. A trusted, professional contractor will be more than happy to share all of this information with their clients. Your contractor should offer competitive prices but not make compromises in the services they provide. If a contractor ever guarantees a price that seems too good to be true, they are most likely cutting costs in other areas of your paving services. Sometimes receiving multiple estimates can be beneficial to finding the right contractor. By understanding the general range of expenses for your pavement needs, you can determine which company seems to have the most legitimate paving practices. When considering the price of each contractor it’s important to understand the desired services your driveway may need and their protocol for repairing or replacing your pavement. Before any work is done on your home, it is best to have a written contract outlining costs and procedures. Contractors generally use contracts to ensure they get paid after the process, although they are equally effective for protecting costumers. A contract can outline all the potential work that has to be done, so you can ensure all the necessary work is done in the fashion discussed. Always fill out an in-depth contract prior to beginning your driveway repairs. When considering a pavement specialist, research is always your friend. Most contractors will work with you to help you decision on specialist and type of service easier. Be weary of who you trust with your driveway however. Those who promise new techniques at absurdly cheap prices are likely out to scam potential customers. You should have a contractor that keeps your interests in mind and cares about the long term success of your pavement, like we here at Greenway Industries. Previous PostPrevious Why Choose an Asphalt Driveway?